Why do astronauts in the space station float? Because there’s no gravity in space. Oh. Umm… Wait. That doesn’t make any sense! If there were no gravity in space, what would keep the space station orbiting the Earth in the first place? I think the space station has rockets that make it go round the earth in a circle. No it doesn’t! They always turn off their rockets when they get into orbit! Besides, the Moon orbits the Earth too, and it certainly doesn’t have rockets. Oh. Hmm. Well, maybe the walls of the space station shield the astronauts from gravity or something? Walls to keep out gravity?! That doesn’t work on earth, as far as I know. Why would it work in space? Floating Free — but How Free? Astronauts in the space station, and all of their equipment, appear weightless, floating about without any support, as though gravity, which holds us to the ground here on the surface of the earth, has no effect upon them. Why? So… what’s behind all that floating? To be truly weightless is to be free of the pull of gravity. It’s a remarkable feature of our world that even in the presence of gravity, apparent weightlessness is possible, under the appropriate conditions. And the reason for this starts with a simple experiment you can do yourself. Intuitively (if you don’t pay close attention) it may seem to you that things that weigh less fall more slowly than things that weigh more. You will have seen rocks or books or precious computers and pottery drop rapidly to the floor, sometimes with disastrous effects, while sheets of paper, leaves, and feathers take their time. Tiny grains of dust even float, as you can see when sunlight enters a dusty room through a window. But this intuition isn’t right. In fact, all objects in the same general vicinity, if pulled only by gravity, fall in exactly the same way. This point about being “pulled only by gravity” is crucial; things fall uniformly only if there are no other forces affecting them. In particular, this is only true in the absence of strong air resistance [the tendency of air to oppose being pushed aside by a moving object]. For feathers and leaves and sheets of paper, air resistance is a big effect; their fall is slowed as a result. However, sufficiently heavy and/or compact objects are not affected by air resistance, and all fall at the same rate. Not convinced? Enough talk: do an experiment. That’s the heart of science, after all. Take a few coins of different weight (a penny and a nickel and a quarter, for instance), and a couple of books of different weight (perhaps a child’s paperback, a novel, and a big cookbook), and drop any two of them, straight down, together from the same height, at the same time. No matter which objects you choose, no matter how high you drop them from (as long as it is not so high that air resistance becomes important), you will find they will always land at the same time. End of discussion!! Yes, you can verify yourself that when air resistance can be ignored as a small effect, all objects, no matter how heavy, fall in exactly the same way. DO THE EXPERIMENT. DO IT NOW. IT WILL TAKE YOU LESS THAN ONE MINUTE. IT MAY CHANGE YOUR LIFE. Still not convinced that the air is responsible for the slow fall of a piece of paper? Try this experiment: Put a piece of paper flat on the top side of a book that’s larger than the paper, as shown in Figure 1, and drop it together with the book, with the paper parallel to the floor. 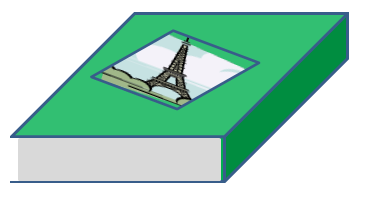 The book underneath will prevent the air from resisting the falling paper, and as a result the paper, pulled only by gravity, will drop just as quickly as the book. Fig. 1: If you put a sheet of paper on the back of a book, and drop them together, you’ll find they fall at the same rate. The book prevents air from getting underneath the paper, thereby removing the effect of air resistance, and allowing gravity alone to act on the paper. Is even this not enough to convince you? Well, here’s an experiment that was done by an astronaut on the Moon. The Moon pulls objects towards its center just as the Earth does. The force of gravity at the Moon’s surface is a bit weaker than the force of gravity on the Earth’s surface — but this is a minor detail. What’s really important is that the Moon has no air above its surface. And therefore, while a feather will tumble and fall more slowly than a hammer at the surface of the Earth, due to air resistance, this is not true on the Moon… as was demonstrated in this famous video. This simple experiment shows that in the presence of gravity and the absence of air resistance and any other forces, all objects in the same vicinity fall in the same way. No less than Galileo himself is famous for formulating this hypothesis, and testing it by dropping cannon balls of different weights from the side of the Leaning Tower of Pisa. Did he really do this experiment? Historians disagree. But as you’ve just seen (if you did the experiments I just suggested), you don’t need your own Tower of Pisa (or Galileo’s brilliance) to convince yourself that he was right. And you can be sure Galileo didn’t do the Tower of Pisa experiment in order to convince himself! He had surely done the kind of experiment you just did a moment ago, and he was already sure of the answer. Perhaps his Leaning Tower demonstration (if it really occurred) was meant as a public display to convince doubters, or perhaps he did it to test the hypothesis more precisely to make sure it was exactly, not just approximately, right. Today, there is even better evidence. As we will see, this very hypothesis assures that astronauts (and their equipment) float in the space station! Why? In what sense is all this falling related to floating, which would seem to be its opposite?!? Fig. 2 (click to animate): Three objects, initially held in place, and released simultaneously, fall together under the force of gravity near the Earth’s surface. Their height (relative to their starting point) is shown at left. I’d like you to think about your coins-and-books experiment again, with a new twist. Imagine that, along with your books and your coins, you dropped your cell phone, with the video camera running. You probably don’t actually want to do this experiment for real, unfortunately. It will probably be difficult to carry it out convincingly. First, you will have to drop the cell phone very carefully so that it doesn’t rotate as it falls; otherwise you will lose sight of the other falling objects and the effect won’t be clear. Second, unless you drop the coins and books from a significant height, the video will be very short, but if you drop the phone from that height, even onto a soft surface, you risk damaging it. So just try to imagine doing it. What will your cell phone’s camera see? Since it is falling at exactly the same rate as the books and coins, it will appear to its video camera that the books and coins are floating. The room will appear to be moving upward as the phone falls, but the objects that are falling with the camera will appear, to the camera, to be weightless! They’re not weightless of course. They’re falling, under the pull of gravity. But to the falling camera, they appear weightless. To demonstrate this, I’ve made a couple of very simple animations. 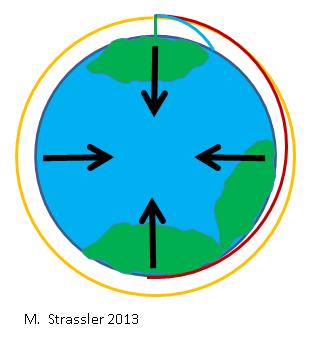 Figure 2 (click it to animate it) shows three objects falling as they would in the Earth’s gravity. They’re all initially stationary, two at the same height, one below the other two. At the same moment, they are all released, and begin to fall under the pull of gravity. The scale on the left shows the distance they have fallen. You may observe that they fall with faster and faster speed, because gravity, as it pulls straight down, causes their downward speed to increase with time. This is why it hurts to jump from a high table, even though jumping from a low step hurts not at all; you’re moving faster when you land. But these interesting facts aren’t essential to why astronauts float, so we won’t explore them today. Figure 2, on the other hand, shows the same three falling objects, from the perspective of a falling camera that began falling at the same moment as the three objects. From the camera’s perspective, the distance scale is moving, but the three objects are simply floating. They appear weightless! Fig. 3 (click to animate): As in Figure 2, three objects, initially held in place, and released simultaneously, fall together, but this time are shown as viewed by a falling camera. Notice they appear to float; the room appears to move upwards, as shown by the scale at left. From this we learn a principle of gravity: from the perspective of an object (such as a video camera) that is falling under the force of gravity but is not significantly affected by any other force (such as the effect of air resistance), all other nearby objects that are also falling under gravity, and are affected by no other forces, will appear to float — that is, they will appear to be weightless. In short, apparent weightlessness is possible because all things in the same vicinity pulled only by gravity always fall at the same rate. Now suppose I sent you and your camera and your books and coins someplace where there is really no gravity. Every object in the universe pulls with gravity on every other object, so to get away from gravity would require you to go far, far, far, unimaginably far out into space, far from any planet, star, or galaxy, so far far far from home, in the deepest darkest emptiness, that the force of gravity out there would be too tiny to notice. You’d be truly weightless, and you’d float, along with your camera, books and coins. What your camera would see would look pretty much the same as in the experiment we just discussed, where the books, coins and camera all fell together under Earth’s gravitational pull. Apparent weightlessness and true weightlessness can be hard to tell apart! But wait, you’d say, it’s easy to tell the difference. In the video shot by the falling camera, the room appears to rise, at a faster and faster rate as the camera falls.The apparently-moving room is a clue that would help us recognize that we were dealing with apparent weightlessness. Out far in space, there’s nothing like the room rushing by, and that would be expected for true weightlessness. Ah, I’d say; not so fast. Let’s put the books, camera and coins in a closed box (along with a lightbulb, so that the camera can see.) Heck, let’s take a box that’s big enough that we can put you inside it too, so you can watch what’s going on. First, let’s start somewhere above the Earth’s surface, and drop the closed box with you, the books, coins, and camera inside. You, and the box, and the books, and the coins, and the camera, all falling at the same (faster and faster) rate, will all seem to you to be floating. You will feel nothing pulling on you or pushing on you. Of course, since you’re in the box, you can’t see the room outside going by. (See Figure 4.) All you know is that everything in the box is floating; you know nothing about what’s outside the box. Only those of us outside the box know that you’re actually falling under the force of gravity — that you only feel weightless. Fig. 4 (click to animate): Same as in Figure 3, except now the objects fall within a falling enclosed box. Any person inside and falling with the box will experience apparent weightlessness, and, unable to see outside the box, will be prevented from distinguishing this from true weightlessness. Of course this experience of weightlessness won’t last. Eventually you and the box will hit the ground, or (ideally) a parachute will open and keep you from disaster. But still, during the period of apparent weightlessness, you have no idea that you’re falling. And now let’s again take you and all your belongings, inside the closed box, out into deepest darkest space, so far from all other objects in the universe that there’s no gravity to speak of. You and the box and everything in it are truly weightless, so everything in the box is floating, unaffected by any forces. Those of us outside the box know that you’re way off in space. But for you, the experience is exactly the same as in the case where you and the box are falling. Inside the box, without knowledge of the outside world, the experience of apparent weightlessness and the experience of true weightlessness are very difficult to distinguish! Actually, it’s not just difficult to distinguish them. It’s impossible. Inside a small closed box, affected by gravity and no other forces from outside the box, there is no experiment that you can perform that can distinguish between apparent and true weightlessness. I am actually not sure who first stated this fact. But it is an obvious consequence of the laws of nature that Newton first wrote down in the 17th century. Probably Galileo was also aware of it. Newton’s attempts to capture the laws of nature in mathematical formulas were revised by Einstein. First Einstein revised Newton’s equations that describe how objects respond to the pushes and pulls of forces. (This was part of his theory of special relativity, first outlined in 1905.) But Einstein immediately realized that his ideas were inconsistent with Newton’s law for gravity, and that he would have to revise that too. In trying to invent the right equations, which he called “general relativity”, he guessed — brilliantly, as it turned out — that his equations would have to preserve this fact we’ve just learned: that inside a small closed box, apparent weightlessness and true weightlessness cannot be distinguished. This property is part of what is called Einstein’s “Principle of Equivalence”. And even though Einstein’s theory of gravity is much more complicated than Newton’s — it took him nearly a decade to find the right equations — both Newton’s and Einstein’s equations share this property! We have one more conceptual step to make. What does it mean for an object to be in orbit around another object, such as a space station in orbit around the Earth, the Earth around the Sun, the Sun around the center of the Milky Way galaxy? The answer is that an object in an orbit caused by gravity is actually falling, forever. This insight is one of the greatest that Newton brought to science… so remarkably simple, and yet so difficult to achieve before he made it obvious. It is this that made it clear to him that gravity — one and the same force — both causes rocks (or apples or books or coins) to fall to the ground AND causes the Moon to orbit the Earth. It’s time for you to do another experiment. REALLY DO IT. Fig. 5: (a) If two objects are dropped from the same height at the same time, they will land at the same moment even if one is initially moving horizontally and the other is initially stationary. (b) If the surface to which they are falling drops away, then the object that lands in the lower region will take longer to hit the surface. (c) In a similar way, the curvature of the Earth means that an object thrown horizontally with enough force will (in the absence of air resistance) take longer to reach the ground. An important distinction between (b) and (c) is that gravity pulls always toward the center of the Earth, so its direction (black arrows), relative to the original starting point, changes as the object moves. Take two coins, or two books, or a book and a coin, generally of different weight. I’m going to ask you drop them at the same time — just as you did before — with a small change. Drop one of them straight down, but drop the other while throwing it forward. Make sure you throw it exactly horizontally, so that it is going neither up nor down when you throw it. (If it goes up or down when you throw it, you won’t see the effect I’m about to describe.) What you will find is that both objects land at the same time, though of course not in the same place (Figure 5a). The harder you throw the second object, the further away it will land. But the fact that it takes the same amount of time to fall (assuming the surface you’re standing on is flat) is evidence that gravity is the only force causing it to fall, and that gravity pulls downward (vertically, toward the center of the earth) but has no effect on horizontal motion. Now do it again while standing near a table. Repeat the experiment, but arrange that the coin you drop straight down lands on the table, while the coin you throw lands beyond the table’s edge, on the floor. Obviously, since the coins would land at the same time if they both hit the table, the coin that has further to fall will take longer to land. If you did the same experiment with two rocks while standing on a tall cliff, the time for one rock to land at your feet would be far shorter than the time for the second rock to land at the foot of the cliff. See Figure 5b. Now, again, we must appeal to your imagination, because you can’t really do this experiment. Suppose you could throw harder and harder. For example, maybe you could fire a rock off a cliff using an air gun. Would it take the same amount of time to fall as a rock you merely tossed off the cliff? If it weren’t for possible effects of air resistance, the answer is yes; even if the rock traveled a few miles (kilometers) before hitting the ground, it would travel the vertical distance in the same amount of time as it if were dropped straight down. Now imagine that your air gun were so powerful that you could hurl the rock a few hundred miles away. (Again, you have to imagine there’s no air resistance — if you need to, imagine doing all these experiments on the Moon, where there’s no air and no air resistance, making these experiments a bit more realistic.) Well, at that distance, you would begin to notice that the surface of the Earth isn’t flat — it’s curved! The Earth, after all, is more or less a sphere, not a flat table. And so, as shown in Figure 5c, the time it takes the rock to land will be longer than if it were dropped straight down. As the rock travels horizontally, the Earth drops out beneath it, similarly to but more subtly than the way the Earth drops away if you are on top of a mountain. There’s one difference though! As the rock travels horizontally, the direction gravity pulls begins to change. It is no longer vertical, relative to the starting point; it is vertical relative to the ending point! Gravity always pulls toward the Earth’s center, which is, of course, why people living on the sides of the Earth don’t fall off. Turn up the power of the air gun! Now the rock is traveling so fast that, if fired from the top of Mount Everest, it will cross the Pacific Ocean and most of the Americas before landing perhaps in Buenos Aires. It has fallen halfway around the world. As in Figure 6, the Earth disappeared from underneath the rock as it fell, allowing it to fall thousands of miles. But as it fell, the force of gravity due to the Earth pulling on the rock changed direction. That force is always toward the center of the Earth, so it kept the rock falling not vertically in the picture but toward the center of the Earth. And that pulled the rock into the red spiral trajectory shown in Figure 6, starting in Nepal and ending in Argentina. It falls very slowly indeed, with the distance between it and the Earth’s surface decreasing just a little each minute, for a trip lasting a bit less than one hour. Turn the air gun’s power up just a bit more… and if you fire it just right, the rock will never land. It will fall, but as fast as it falls, the Earth disappears out from underneath it. And so its distance from the Earth’s surface remains constant, as in the orange curve in Figure 6. This is what we call ORBIT (more precisely, a circular orbit.) An object in orbit around the Earth is falling — with sideways motion that is so rapid that as it falls, the Earth’s surface moves away, at just the right rate that it falls around the Earth. Orbit is the fall that lasts forever. This is exactly what the Moon is doing in its orbit around the Earth. It is falling, but moving sideways so rapidly so that instead of approaching the Earth’s surface, it remains at an approximately fixed distance. Its path is like the orange curve in Figure 6, although much further away. This is what the Earth is doing around the Sun. This is what the Sun is doing around the Milky Way galaxy. And this is also what the space station is doing around the Earth. It, and the objects inside it, including the astronauts and their equipment, are falling. They are falling because of gravity, and no other forces. They are all falling together. And they are avoiding hitting the ground for the same reason as our imaginary rock, and the orange curve in Figure 6: their sideways motion is just fast enough that their distance from the Earth’s surface remains constant. But we already know that objects that are all falling together inside a closed box, like the space station, will appear weightless! They are not weightless; it is gravity that keeps the space station, the astronauts, and their equipment in orbit around the Earth. But inside the station, from the point of view of the astronauts and their cameras who are falling together with all the objects inside the space station, they and all the objects around them appear weightless. As we know already (the Principle of Equivalence), this apparent weightlessness looks and feels just like true weightlessness. And so the astronauts have the experience of weightlessness, even though gravity is acting upon them. And now you know why astronauts float, from the perspective of their video cameras, which is the only perspective from which you ever see them. They float because they and their cameras are falling — falling around the Earth — along with everything inside their closed box. If you look at them from outside their spacecraft — say, from the ground, watching the space station whiz by overhead — you can see they are not floating. They are traveling in a circle around the Earth every 90 minutes! But that doesn’t change the fact that inside the space station, they appear to be floating, and they experience weightlessness that is completely indistinguishable from the real, gravity-free thing. By the way, there’s another example of apparent weightlessness that is used to teach astronauts what it feels like. An airplane is sent up at a very high angle, and then allowed to follow the trajectory that a falling object would follow. From outside, you can see that the plane is first slowing its rise, then descending more and more rapidly, taking the same type of path followed by a ball that you toss to a friend. But the plane is a closed box; and from the inside, everything appears weightless, since all the objects and people inside the plane fall together. Fig. 7: If the path taken by an airplane is the same as that taken by an object subject only to the earth’s gravity — imagine a thrown ball — persons inside the plane will feel apparently weightless. Such planes are used to train astronauts and by film studios for simulating space scenes. Amusingly (distressingly?) such a plane is called a “vomit comet”. In normal life, your stomach and intestines are pulled down by gravity, and they are prevented from falling to the floor by your lower torso. But when you feel weightless (whether the weightlessness is true or apparent) then your stomach and intestines are no longer being pulled down from your body’s point of view, and your lower torso no longer has to support them. The sensation of one’s inner organs floating inside one’s body, instead of sitting in their normal place, makes many people feel nauseated; you may have briefly felt this if you have been in an airplane that descended suddenly, or in a car that dropped into a dip in the road. Such are the risks of the vomit comet, and apparent weightlessness. Works for anything smaller than a galaxy, eh? Fig 2 works, but Figs 3&4 just jiggle with no moving scale. Thanks Matt, now I completely understand. Your step by step explanation is excellent ! relativity is a common sense. To disprove relativity theory, we must go far from our piece of flat universe. So gravity-free thing is a dream. We can also feel this apparent (clearly visible or optical illusion) weightlessness, little bit, when we travel up and down in an elevator. Because of the speed of space station (closed box), the curvature of its travel, along with earth’s, is so rapid, that the camera or the human eyes only lose its orientation – not the gravity ? – so it is phenomenological. The principle of equivalance is geometrical, to localize numerical calculations (axiomatic) – and to replace this phenomenological phenomenon ? There is no relative mass (from reference frame of earth) ? – the object that is moving at relatavistic speed its own mass hasn’t changed – it’s only from the reference frame of the “at rest” observer that the object’s mass has increased. – The kinetic energy (orbital) of closed box equals its rest mass ? Is there any RELATIVE mass making an anti-gravitatinal field? – I mean the space station expend energy and must come down ! If the closed box have mass equal to earth what happen ? Kudzu — you’re making an error. E = m c^2 ONLY for objects at rest — such is the convention in particle physics. Particle physicists NEVER say that mass increases with energy — and for good reason. If it did, then photons would be particles with mass. “Mass”, as used on this website, ALWAYS refers to what some call “rest mass”. And I am consistent about this. There are good reasons for this convention but I don’t have time to remind you of them just now. Very true; it is something that is stuck in my brain and will take time to remove I am afraid. This surprises me. “Rest mass” implies that it does not change with an object’s momentum, but I was convinced that systems which gain internal energy also gain rest mass. Am I mistaken, or are you just saying that rest mass never changes with the kinetic energy of the system? Thank you Mr.Kudzu, for explaining the Equivalence principle. When leaning on a big ship at dock and slowly but surely push it around, we feel as if, we are pushing it around by our own craft. But in physical reality the ship moves around – outside phenomenology. But regarding “mass” the phenomenology is glued more with physical reality in a non axiomatic manner – where we require relativistic theory. (Inertial mass) x (Acceleration) = (Intensity of the gravitational field) x (Gravitational mass). So the intensity of gravitational field of a “point particle” – unlike black holes – is zero or non zero “0^2 ? Indeed the equivalence of gravitational and inertial mass is a puzzle, it doesn’t have to be that way. If a point particle had all its mass in one infinitely small pointlike volume then it would have an infinite gravitational field at that point and would be (I think but am not sure) a naked singularity. Fortunately a pointlike particle actually occupies a substantial volume of space. (If you try and ‘squash the particle down’ you can, but that takes energy. Squash it too far and it will collapse into a black hole.) This is why it’s nice to think of particles, pointlike or not as waves rather than things with a definite invariant size. Some speculation is that the large and small Magellanic Clouds are orbiting our galaxy. Andromeda may be approaching for it’s second pass at us, according to some. The center of mass of a cluster of galaxies would orbit a neighboring cluster, and on it goes. These orbits would average far from circular, as in cometary orbits. I meant to suggest that orbital phenomena aren’t restricted to sub-galactic scales, but didn’t say that at increasingly larger scales they are dominated (and rendered insignificant) by the expansion of the universe. Most galaxies we see are red-shifted, but some are blue-shifted. Thanks, I was thinking about dark matter/energy. Aren’t there some guesses that effectively tweak gravity? You are thinking possibly of MOND http://en.wikipedia.org/wiki/Modified_Newtonian_dynamics theories of which suggest that gravity acts differently at large scales. Sadly it seems unlikely to be the case. Well done. That is the same approach and concepts we used when I still taught high school physics. You made me feel like I was back in the classroom. I came to enjoy and admire your site, and what I like the most is your utmost honesty about shortcuts/white lies/simplifications that you always keep in your explanations. 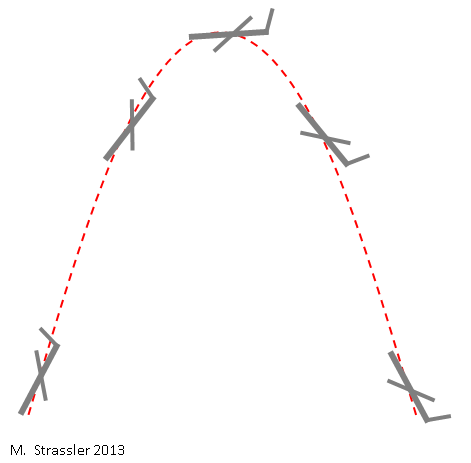 For that reason, I found it rather out of place when you write that “[gravity] pulled the rock into the red spiral trajectory shown in Figure 6”. At the level of approximation used in all examples (no air-drag[*]) it is a half ellipse after all, and it would be even cool to say that if you just dug a little trench in just the right place in Argentina and repeat the experiment, the projectile might hit you in the back of your head! I find this inconsistency especially jarring because it reienforces a common comic book perception of things “spiraling” towards planets as they fall. *) With air-drag, both red, blue and yellow lines would be probably a very short spiraling and blazing trails for most of the materials and shapes of the projectile, wouldn’t they. A fair criticism. Of course the difference is minimal with such a short pathway, but as you say, the statement is inaccurate and could be easily made accurate. I’ll try to remember to fix it. The last part should be shortened a bit. Nausea from weightlessness is more from the balance system, involving the inner ear and the cerebellum, among other systems, going awry. Being upside down also frees the lower torso from supporting the intestines but typically causes no nausea. Those exposed for long periods to free fall also lose muscle and bone. But overall it is surprising how easily life adapts to weightlessness; evolution seemingly not relying much on its presence. I found your explanation of apparent weighlessness very useful. I would add an only consideration: if objects did never reach any abstacles to their falling (actually impossible because sooner or later they reach Earth’s or any other heavenly body’s surface) physicists would never have had the idea of gravity. They invented the concept of gravity as a conservative force, but only the existence of non conservative force, ironically, as the impulsive contact between object and Earth’s surface, allowed the “existence” of gravity. Didn’t Emmy Noether demonstrate that any symmetric field is conservative? Violations of that are the rabbit holes down which we tumble. In Newtonian theory gravity is a “force of attraction.” In general relativity gravity is a “manifestation of spacetime curvature.” What I’d like to know is what does matter do to create the force or the curvature? Possibly a clue or two would be forthcoming by performing an experiment implied by Franco’s response above. Franco suggests that it is not possible for an object to fall without reaching the obstacle (surface) of the body(ies) responsible for the falling. Actually, Galileo was the first to propose just such a thing. (Dialogue Concerning the Two Chief World Systems, pp. 22, 227, 236.) If a large body has a hole through its center we can observe what happens when a small body is dropped into the hole; no obstacle, no collision. You might call it a Small Low-Energy Non-Collider. The essence of the idea is commonly presented in freshman physics. But the “answer” is always given without any empirical evidence. Nobody has ever witnessed two bodies whose radial falling is due to only their own gravity. The experiment could be done either in an Earth-based laboratory (with a modified Cavendish balance) or in an orbiting satellite. For all the fancy expensive experiments that physicists are capable of, isn’t it curious that this simple one proposed by Galileo nearly 400 years ago remains undone? Matt, this is a nice enough article, but it’s all easy stuff. How about you have a go at “Why Does an Electron Fall Down?” Once you’ve explained gamma-gamma pair production to your grandmother, that’s easy too! In 1660 itself, Christiaan Huygens sought explanations of the force of gravity that avoided action at a distance. So matter have their own gravity due to invariant mass is still unexplained. The works on simple harmonic motion, elastic collisions, and conservation law, envisaged the “force” is something out of matter – first a kind of kinematics of blackbody radiation – then the void between quanta. Light behaved well experimentally with this Geometrical property. Because of this Geometry, efforts to account for action at a distance in the theory of electromagnetism led to the development of the concept of a field which mediated interactions between currents and charges across empty space. Maxwell’s equations connected this with light – made Einstein to connect it with his relativity and Geometrical property of light (special relativity). I could not understand why this Geometrical property of light was connected to gravity via General relativity ? In order to complete my thought on gravity, very kindly quoted by Richard Benish (whose interesting articles on detecting “interior” gravitation by pseudo-Cavendish apparatus I read this afternoon): I can’t realize a body’s falling if I’m falling along with it. Gravity is usually a trouble when we are at rest when object falls (e.g. it hits our all foot…). In a world where all things fall, maybe vocabulary misses the word “falling”. Great explanation as always. I’ve guided many along this same path. One extension of these ideas goes back to the airplane. The vomit comet, as you say, simulates weightlessness. But why doesn’t an airplane in ordinary flight do the same thing? I use this question to help learners see the wisdom and power in using a Newtonian explanation of airplane flight, rather than the convoluted Bernoulli explanation you often see in popular accounts. Airplanes fly by moving air down! Also, are you aware of the device known as Einstein’s Toy that demonstrates the (apparent) weightlessness of freefall? It’s a cup with two balls suspended by rubber bands. When held in the hand, these balls hang out of the cup, balanced by the tension of the rubber and their own weight pulling down. When released, the rubber band tension pulls the balls into the cup, because of course the (apparent) weight of the balls goes to zero. It’s a dramatic and effective demonstration of this (apparent) weightlessness. By the way, I put apparent in parentheses because I am wondering what you think about the use of that word. It’s just pedagogy, not physics, but isn’t one of the lessons from Einstein that if two things seem equivalent, they really are? i.e., if apparent weightlessness is indistinguishable from actual weightlessness, aren’t they the same thing? I’m tempted to say that when you’re in freefall you really are weightless, not just that you seem to be. What do you think? I found this to be an clear and informative article. One minor quibble, however — the moon does have a negligible atmosphere http://en.wikipedia.org/wiki/Atmosphere_of_the_Moon. I guess in doesn’t provide enough air resistance for it to matter in this context, but perhaps a random weasel word would make things more technically correct. A minor niggle. You write: ” Inside a small closed box, affected by gravity and no other forces from outside the box, there is no experiment that you can perform that can distinguish between apparent and true weightlessness. ” This is not always true. Imagine that you are in the box, freely falling towards the surface of the moon. Take two coins from your pocket, one in each hand, and release them simultaneously, some distance apart. They will appear to float in mid-air. However, because you and everything else in the box are falling towards the moon’s centre of mass, everything is actually following slightly different, converging paths. Thus, the two coins will gradually approach one another, telling you that you are only under apparent weightlessness. Thanks, Professor. I’ve always understood the phenomenon, but didn’t have all the theory. I always thought it cool that when I dropped a penny, the earth moved up to the penny. But try this one: which weighs more, a pound of gold or a pound of feathers? Answer: a pound of feathers. Feathers are measured by avoirdupois weight, gold by troy weight. Sneaky, what? is supposed to prove the equivalence principle which states that the acceleration an object feels due to gravity does not depend on its mass, density, composition, colour or shape. If a hammer and a feather are dropped from the same height on earth, the hammer will hit the ground first as the feather is slowed down drastically by air resistance. This may not be absolutely true since every object has its own gravity which is greater if its mass is greater. So the hammer has a gravity much greater than that of the feather. Therefore the combined gravity of the hammer and that of the moon (which pulls the hammer and moon towards each other) is greater than that of the feather and the moon. As such the hammer should collide with the moon marginally earlier than that between the feather and the moon, though this difference is so minute that we assume that the collisions occur simultaneously. However, if the hammer and feather are dropped together, then as the hammer’s gravity pulls the moon towards itself, it also pull the moon towards the feather and as such the lucky feather may get a free ride and hits the moon at the same time as the hammer. To be fair, the experiment should be done dropping the objects individually e.g. feather first, then the hammer and then see whether the times taken are the same or not. All the above are valid only on the assumption that the centre of gravity is the part that hits the moon but since this is not necessarily true, we also have to take into account which part of the hammer or feather is nearest to the moon before the two objects were released (assuming that the centre of gravity of both objects are at the same level on release) ! The real answer is that there is not enough data for us to know which will hit the moon first ! The famous experiment by Astronaut Dave Scott on the moon is not very precise and may even be misleading. Contrary to orthodox science, the Equivalence Principle (EP) upon which general relativity (GR) is based is an invalid idea. The conditions inside a falling box and a box in outer space far away from any mass are kinematically equivalent but dynamically very different as different forces operate! In fact a simple experiment exits that can distinguish between the two boxes. Consider a point electric charge fixed in each box. In the box in outer space no radiation will be detected by an observer inside the box since there is no acceleration. However for the falling box, since it is accelerating, electromagnetic radiation will be emitted from the charge that can be detected by an observer within the box. This is an unambiguous test that will allow observers within the two boxes to distinguish between them and therefore represents an emphatic invalidation of the EP. (There are other methods of distinguishing between the boxes) This contradiction has been raised by others and attempts to resolve it have in my view not been successful. Indeed J.L. Synge has long ago suggested that the field equations of GR can be derived without using the EP which he considered to be imprecise and unnecessary. colon cleanse weight loss dr oz Many thanks for another informative site. The place different might I get that type of info coded in such a best method? I’ve a venture that we are just now running for, and that i have already been in the look available regarding these information and facts. I’ll bbe grateful if you continue this in future. Actually, objects of different masses fall at different speeds. Because everything that has mass has gravity. At small sizes, the difference is so small that we can neglect it, although precision instruments can measure it. But at large sizes (let’s say, the size of a moon) the difference would be noticeable… you would have the Earth pulling the object, but the object would also pull on the Earth with considerable gravity and the speed would add. The Zero G NASA Airplane (is) the space station people come on. When did everybody become so gullible. Notice how the international space station is the exact shape and size of the hull of an Airplane. If we were to actually make a space station wich we have (not) then is would be much larger than the hull of an Airplane. It would be very large with multiple rooms and hallways and corridors. Not to mention that the space station is virtually void of Windows. If I were to build a space station I would have a 10 foot by 10 foot viewing window. Seems strange not to out windows everywhere. Were fully capeable of making a window that can with stand the pressure of space. But this is all irrelevant because humans have never been that far up from the Earth surface. Good day. The international space station is useless because all test performed there can be done in a zero g airplane and cost many millions of dollars less. But it makes sense when you realize that NASA is filling our heads with lies while at the same time filling their pockets with taxpayer money. It cost $5000 to take a ride on the Zero G vomit comet. NASA has spent 100 billion dollars on the fake space station in 10 years and it cost 81 million dollars to send a person to it. Anyone can see what’s going on here and it makes sense why NASA needs this to keep up this scherade. I’ll admit I would trick all you fools for that kind of money too so I understand the deception.